Thierry Chopin, marine biology professor at UNB Saint John and scientific director of the Canadian Integrated Multi-Trophic Aquaculture Network (CIMTAN), was the October 2012 invited speaker of the Bacon and Eggheads Breakfast series in Ottawa. Bacon and Eggheads is a flagship series that brings together Parliamentarians with experts across science and engineering, showcasing outstanding Canadian research accomplishments. 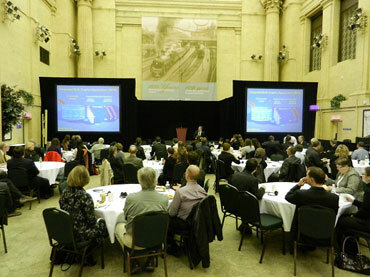 Dr. Chopin's presentation, Towards a More Sustainable and Diversified Aquaculture, was delivered during a breakfast on Oct. 25th to members of the House of Commons, Senators, invited government officials, the Natural Science and Engineering Research Council (NSERC), the Partnership Group for Science and Engineering (PAGSE), the media and invited guests. The breakfast menu included IMTA salmon provided by the True North Salmon Company. Chopin says it was an interesting opportunity to talk about IMTA and the evolution of aquaculture practices to a distinguished and influential audience, which included key decision-makers. "The Bacon and Eggheads Breakfast series is an excellent idea and a very interesting forum to reach people we generally do not communicate with very much," said Dr. Chopin. Some of Chopin's latest work includes the development of a new cosmetic product made from IMTA seaweeds. For two years, Chopin has been working with the company Exsymol S.A.M., from Monaco, on the development of the new cosmetic product Exsymtal® based on an extract of the IMTA kelp, Alaria esculenta, grown at the IMTA sites of Cooke Aquaculture Inc. in the Bay of Fundy. The applications of the product are based on its anti-aging, anti-pollution/anti-stress, dermis filler and dermis renewal properties. Chopin visited the company in Monaco and its research & development and production units twice. He was very impressed by the professionalism and openness of the interdisciplinary team, which spans from chemists and molecular biologists, developing new dermo-cosmetological tests on the active principles, to marketing and financial advisors, who are contributing to the positioning of this IMTA valued-added product in the skincare industry.